This annual dinner and auction is held every fall and is the school’s largest fundraising event. Alumni are invited to attend the event at a discounted rate and many alumni volunteer their time, talent, and treasure, to make the event a success. The 2019 Angel Flight is set for Saturday, October 19, 2019. Organized by alumni and alumni parents, this March tournament pits classes against each other in a two day, all-alumni, basketball battle. Skutt Catholic sets aside this special day to show appreciation for the grandparents and other special friends who play such an important role in the lives of our students. The entire student body and their GrandHawks come together to celebrate mass, followed by a reception. In celebration of Skutt Catholic’s 25th year, we hosted our inaugural Hall of Fame Induction on Saturday, March 24, 2018. Skutt Catholic​’s​ Hall of Fame honors the individuals, teams, and groups who have contributed ​to our rich tradition of excellence. Seeking recipients from all areas of the school, ​​​members of this group have helped define and advance our institution and its mission. Recipients of the Hall of Fame award are exemplars of exceptional accomplishments and service and thereby set high standards for Skutt Catholic students. Tim Davis, Nate Ruffino, Ben Hall, Justin Cooley, Mark Scholz, Kasey Kohl, Adam Banke, Matt Davis, Chase Farmer, Matt Morkel, Chas DeVetter, Matt Freyer, Mitch Waite, Eric Kauffmann, Nate Olson, Adam Johnson, Mike Strawhecker, Mike Mutchie, Seth Kolar, Tom Kropf, Dave Kirk, Pat Sullivan, Alex Mohanna, Nick Reuting, Chris Drew, and Charles Olson. The Hall of Fame Induction is a bi-annual event with the next one scheduled for March 2020. HawkWalk is an annual event at Skutt Catholic High School. Each year, students, faculty and staff are asked to solicit sponsorships for a five-mile trek around Lake Zorinski, with the money directed toward financial aid. There’s no better time to reminisce about your glory days than on Moylan Field during the homecoming football game. Bring the whole family and reconnect with alumni under the tent for food, drinks, and another SkyHawk win! The Alumni Homecoming Picnic is scheduled for Fri., Oct. 5, 2018. Set for November 4, this special Mass is held to honor the beloved deceased members of the Skutt Catholic family who passed away from January 1 to September 20. 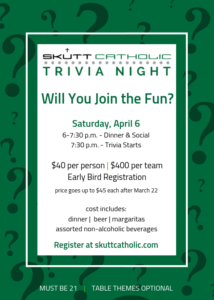 RSVP to Lucy Smith (lucysmith@skuttcatholic.com) by October 28 if you plan to attend. We want to ensure your comfort with ample seating and refreshments. Please click here to submit the names of your loved ones to be honored.